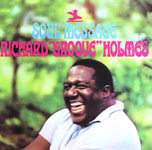 Richard Arnold Groove Holmes, Born Richard Arnold Jackson (Camden, New Jersey) was a jazz organist who performed in the hard bop and soul jazz genre. He is best known for his 1965 recording of Misty, and is considered a precursor of acid jazz. Holmes died after a long struggle with prostate cancer, having performed his last concerts on a wheelchair. One of his last gigs was at the 1991 Chicago Blues Festival with his longtime friend, singer Jimmy Witherspoon. Happy Birthday, Richard "Groove" Holmes! All About Jazz musician pages are maintained by musicians, publicists and trusted members like you. Interested? Tell us why you would like to improve the Richard "Groove" Holmes musician page.